Agriculture in the U.S. Midwest is dominated by two crops—corn and soybeans—grown continuously or in simple rotation, a trend that may have worsened in recent years. The most important change we could make to move toward a healthy, sustainable food system would be to grow and rotate a variety of crops including wheat, oats, alfalfa and other legumes, and sorghum in addition to corn and soybeans. Growing a greater diversity of crops would allow farmers to reap the environmental and energy advantages of longer, more complex crop rotations. Recent research has demonstrated that multi-year, multi-crop rotations produce high yields for each crop in the rotation, control pests and weeds with less reliance on chemical pesticides, and enhance soil fertility with less need for synthetic fertilizers. Pests and weeds. Because most pests are adapted to thrive on only a limited number of crops, a crop rotation that includes non-host crops will drive down their numbers. Reduced use of chemical pesticides, in turn, encourages beneficial organisms such as soil fungi, pollinators, and predatory and weed-seed-eating insects and spiders that further reduce the need for pesticides, which benefits the environment and saves farmers money. Recent long-term research in the heart of the Corn Belt has shown that integrated weed control based on smart crop rotations can reduce the need for fertilizers and herbicides by 90 percent or more, while maintaining high yields and farm profits. Soil fertility. Rotations that include nitrogen-producing legumes such as peas, beans, and alfalfa provide subsequent crops with substantial amounts of this critical nutrient. And recent research shows that nitrogen from legumes remains in the soil longer than the nitrogen in synthetic fertilizers, leaving less to leach into groundwater or run off fields and pollute streams. In addition to grain and forage crops, the climate and exceptionally rich soils of the Midwest are well suited to a number of other crops including vegetables and fruit trees. While few now remember it, a century ago at least 10 food crops were grown commercially in Iowa, including potatoes, apples, and cherries. Bringing back such crops, especially sought-after heirloom and specialty varieties, represents an opportunity to market foods that could be branded based on their place of origin and sold at premium prices. New additions to the rural landscape could also include bioenergy crops such as perennial grasses. 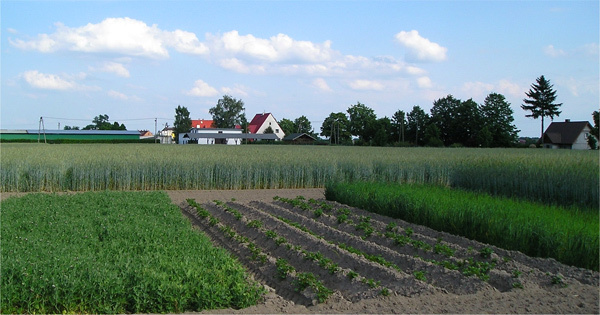 These so-called cellulosic feedstocks can be grown on marginal land, enhance soil fertility by promoting the growth of various soil organisms, and provide a climate- friendly source of energy (their deep roots and long lives enable them to keep more carbon out of the atmosphere than annual bioenergy crops such as corn, whose growth is typically assisted with carbon-intensive fertilizers and pesticides). Explore the sustainable, science-based future of American agriculture.